I am getting excited about receiving my new SONY gear by Fed-Ex tomorrow. I was glad to learn that Patrick Sparkman sold most of his Nikon fire-sale stuff (including his 600 VR!) in one day. You can see his new used D850 listing and the remaining item below. I had heard of an online shutter count site for many years and without thinking assumed that you needed to connect the camera to your computer for it to work. Wrong, wrong, and wrong. Simply take one image with the camera in question. Then upload the image to your computer. Then click here , click on Choose File, and then on Upload. 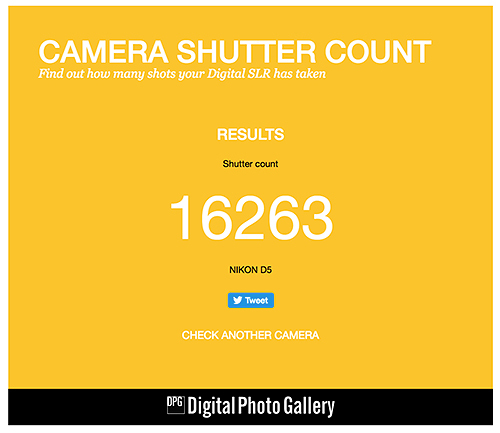 Give it a few minutes and you will have the accurate shutter count for your camera. Nothing could be simpler and it is 100% free. The 16,263 is for the Nikon D5 that I am trying to sell. See the reduced price (and other reduced prices) immediately below. Arthur Morris is offering a barely used (shutter count 16,263) Nikon D5 in excellent to near-mint condition for the BAA record-low price of $4,996.95 (was $5,496.95). The sale includes the original box and everything in it including the front lens cap, and insured ground shipping via United Parcel Service. Yours truly is offering a Nikon AF-S NIKKOR 80-400mm f/4.5-5.6G ED VR lens in excellent plus condition for only $1,699.00 (was $1799.00). The sale includes the original product box and everything that came it including the front and rear caps along with insured ground shipping via United Parcel Service. Multiple IPT veteran, dear friend, and BAA technical advisor Patrick Sparkman is offering a one-year old Nikon D850 DSLR camera body in excellent to like-new condition for $2899.00. The sale includes the original battery, the original battery charger, the MB-D18 Battery Grip, a Sony 120GB G Series XQD Memory Card, the following off-brand items: battery chamber cover, lithium battery, and battery charger — these work like the Nikon versions and raise the frame rate to 9 fps, the original product box, the front body cover, and insured shipping via Fed Ex Ground. Your item will not ship until your check clears unless other arrangements are made. Multiple IPT veteran, dear friend, and BAA technical advisor Patrick Sparkman is offering a Sigma 14-24mm f/2.8 DG HSM Art Lens for Nikon F in like-new condition for $799.00. The lens is 2 months old, and was barely used. The glass is perfect. The sale includes the lens hood, the original box, the soft case that came with the lens, the front cover, the rear lens cap, and insured shipping via Fed Ex Ground. Your item will not ship until your check clears unless other arrangements are made. Good morning Guru. Hope this message finds you in good health and cheerful as ever. So far I remember Nikon has offered this facility for quite a while already. However, Canon always kept it difficult for us. We have to use the EOS Utilities in a complex way to find the shutter count. Fortunately, another vendor has made it easy for us and that’s how I find out the shutter counts of my two Canon bodies (5DII & 70D). Despite some annoying failures, I still stick to Canon DSLRs that I’ve been using since 2009. May be too lazy to try out other options. However, might find their 2nd or 3rd generation Mirrorless versions appealing when they introduce those in future. Their first full frame mirrorless EOS R is already getting positive reviews from some old timers. Take care Guru, as we follow your advices and would love to continue doing so for many years more. Bummer. If anyone knows how to get the shutter count on a 5D IV, please let us know. EXIFTOOL is a medadata extraction program that works with the 5DIV. Here is a link to how to install it and how to use it. So, Art, are you making the full switch to Sony? Unfortunately it doesn’t work for the Canon 5DM4. Tried uploading and software told me that the 5DM4 doesn’t add the count info to the photo file. Unless I’m missing something (wouldn’t be the first time) & someone else was able to succeed.?. ?